From left to right are Alexis Rose, Trista Kuna, Becky Freiday, Emily Wittenberg, Laura Sherry and Emily Hulak of Rutgers University. Kuna won her intermediate flat class while Freiday was a winner in the maiden crossrails class. Rutgers earned six blue ribbons and eight red ones en route to a 35-33 win over Kutztown on November 6th. Readington, NJ - A change to one of the point cards after the conclusion of the November 6th Briarwood show co-hosted by Cedar Crest College and Bloomsburg University provided Rutgers University with their first high point team honor of the 2010-11 season. The Scarlet Knights' total of 35 points was two higher than reserve high point team Kutztown University and four more than current region leader and defending region champion Lafayette College. The 35-score is ten better that Rutgers' previous best of the season, a 25-score at the Kutztown show on October 3rd. Kate Felter (junior, Basking Ridge, New Jersey) won her intermediate fences while placing second in open flat to lead the way for Rutgers. Trista Kuna (junior, East Brunswick, New Jersey, in intermediate flat), Becky Young (senior, Middlesex, New Jersey, in novice fences), Shruti Iyer (sophomore, also from Basking Ridge and also in novice fences), Stephanie Dickson (sophomore, Smithtown, New York, in beginner walk-trot-canter) and Rachel McGovern (freshman, Westfield, New Jersey) also won classes, with McGovern taking first place in the only section of walk-trot held at today's show. 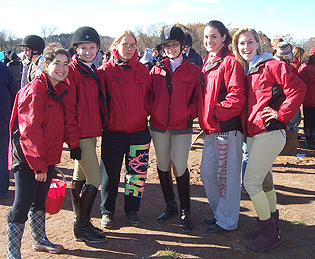 Eight Rutgers riders won red ribbons, including a pair for Amanda Wright in the novice divisions. High point rider honors went to Nicole Pirozzi of Lehigh University. 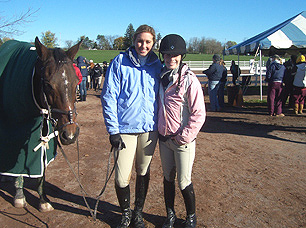 A freshman from Robbinsville, New Jersey, Pirozzi won both of her novice classes to join teammate Maggie Gordon (junior, Jericho, New York) in the ride-off. Gordon won both of her open classes to double her total of 14 open level points entering the day to 28. Also in the ride-off was Alyssa Piccoli of Kutztown University. A freshman from Media, Pennsylvania, Piccoli won both of her novice classes and finished second to Pirozzi in the ride-off. 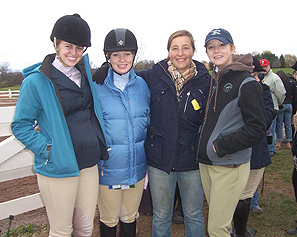 Among those to class up at today's event included Marissa Zondag of Moravian College, second in novice flat but a regional qualifier in both novice divisions; Brittany Collins of the University of Scranton, second to McGovern in walk-trot and one of three Scranton riders to qualify for Regionals, and Carolyn Robinson of Kutztown University, whose second in intermediate flat made her the first Region 4 rider this season to qualify for Regionals in this particular division. Lehigh alumni rider Rachel Suna won both alumni classes and now leads the alumni flat division while tieing for the top spot with 1997 Delaware Valley College graduate Tracey Evans Lightner for the lead in alumni fences through five hunter seat shows. From left to right are Nicole Pirozzi, Kristin Vasmanis, Head Coach Marisa Kalmar and Maggie Gordon of Lehigh University. Though Gordon is an open rider and Pirozzi a novice the latter won high point rider honors in a three-way ride-off. "Whenever I go into the ring, I remind myself that the most important part of IHSA is to have fun. When I walk in with that mindset I always have more success than when I put pressure on myself to win. My love of riding plus the supportive atmosphere of the team is what has created an enjoyable experience that has allowed me to excel." - Danielle Miranda, Lafayette College, who won the open fences class which started the day. "Showing in the IHSA has been such a wonderful experience! I wouldn't be where I am today without Marisa Kalmar and her no-stirrups lessons that sometimes feel endless. Thank you so much Marisa! I also would like to thank the rest of the Lehigh Equestrian team for their help, support, and constant humor on these early mornings!" - Maggie Gordon, Lehigh University, who won both of her open classes. "Equitate! - Last minute advice from my coach, Erin Githens. I tried my hardest to do just that. But never forget, it's about the ride, not the ribbon." - Alanna Reiner, Lafayette College, who won the second section of intermediate fences. 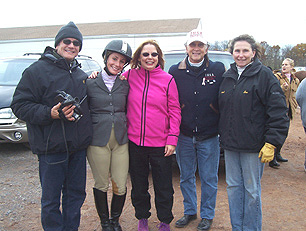 "Thank you so much to Marisa Kalmar and the whole Lehigh Equestrian Team who have all been so helpful and supportive. It has been a real treat to be able to ride and show again!" - Rachel Suna, 2004 Lehigh University graduate, who won both alumni classes at today's show. "I just had the luck of Dave Matthews. I am seeing him tonight in concert so I'm excited for how well I did and that in a couple hours I will be seeing Dave!" - Rachel Krause, Kutztown University, a devoted fan of the Dave Matthews Band and a winner today in open flat. Alyssa Picoli's father picked the right day to bring the cam-corder! The Kutztown freshman won both of her novice classes and placed second in the three-way ride-off. From left to right are Picoli's father, Picoli, Picoli's mother, IHSA Founder and Executive Director Bob Cacchione and Kutztown University head coach Sue Casale. Kutztown went on to score 33 points for reserve high point team honors. "In honor of Eric LeGrand and the Rutgers motto, 'Keep choppin.' It means to always persevere and keep trying, even if things aren't going great. That's what you have to do when you ride. Never let what's already happened change what can happen, because you never know what you can do." - Trista Kuna, Rutgers University, who won the first section of Intermediate Flat. "I was pretty nervous about my first Intermediate flat class. Not only that but I had a horse that wasn't just a 'sit and look pretty' horse. I had to ride. It was a blast! I loved Kyra! But I have to thank coach Jane and the team for all the support and tips! Also, my parents and brother for driving three hours to be here." - Jen Preston, Cedar Crest College, who rode 'Kyra' to victory in the second section of intermediate flat. "As a freshman I had no idea what to expect with IHSA. The Kutztown girls are all so supportive. I've made friendships that will last a lifetime." - Alyssa Piccoli, Kutztown University, who won both of her novice classes to create a ride-off with Gordon. "It's about time I won a novice fences class!!! I just want to thank all of my amazing Rutgers ladies for all of their hard work this year so far. I'm so proud of all of you! Thank you also to my trainer Charlie Transue for making me into a more confident rider and teaching me how to ride the card I'm dealt. Thank you also to our Hunt seat coach Kelly Lamont for her guidance not only by the ring but for helping to create this enormous RUET empire!" - Becky Young, Rutgers University, who won the second of four sections of novice fences. "I'm so glad I decided to ride on the team. My teammates and coach are amazing. Apart from the frigid weather, today was fantastic. I received lucky draws and happened to not screw anything up too much. Thank you to Marisa Kalmar for the coaching, Maggie Gordon and Alex Neumann for driving me to lessons, and Katie Moulton for helping me improve my punctuality! - Nicole Pirozzi, Lehigh University, who won both of her novice classes to create a three-way ride-off for high point with Gordon and Piccoli. "1st Blue Ribbon for IHSA! Couldn't do it without the support of my awesome RUET girls and amazing coach! A special thanks goes to my everything in life, Katie Caracappa. Without her I would be a mere shell of a rider." - Shruti "Shrutables" Iyer, Rutgers University, who won the fourth of four sections of novice fences. "I was a little nervous, since this was the first real course I've done in a few months, and my first jumping class at a real show in years! However, my draw Moon was very honest and we had a good, consistent ride. I made sure to remember that I'm doing this because I love it and it's the most fun there is, and the rest was history! I'm so glad to have this opportunity to stay involved with the horse world while pursuing a higher education. Thank you IHSA!" - Rebecca Freiday, Rutgers University, who won her maiden crossrails class." - Becky Freiday, Rutgers University, who won the lone section of Maiden Crossrails. "Martel" (on left) stands still while Jess Grabowski (center) and Alanna Reiner of Lafayette College pose for a photo. Reiner, a freshman from Morristown, New Jersey won her intermediate fences while Grabowski was second. Reiner was one of only three Lafayette riders to win a class at today's show. Still the Leopards fell by only four to Rutgers and still lead the region by 32 points. "I've had a great time at our co-hosted show today and had a great draw. It always feels amazing to get a first place ribbon; gotta love the blue! Being my senior year, I'm sad to be finished with riding in IHSA but it's been an amazing experience. If it weren't for the support of my family, my friends, and my teammates, I wouldn't have gotten where I am today, so I thank all of them so much for everything they've done for me. I hope to make this year the best yet and get some more blue ribbons to take with me after graduation!" - Emily Wohl, Bloomsburg University, who won the first section of advanced walk-trot-canter. "Going into the show ring I was a little nervous because it was only my second class but with my trainer, Alli's tremendous support I walked into the ring with confidence and walked out with a blue ribbon." - Macaire Kolchin, Moravian College, who won the second section of advanced walk-trot-canter. "I come from a dressage background so I haven't ever gone out to win in a hunter equitation class, but after coming to Amie's barn I have recieved nothing but support. She has given me a lot of confidence in riding horses other than the ones in my own barn and tolerates all my nervous goofy things." - Lindsay Ferris, Bloomsburg University, who won the third section of novice flat. "Ride hard, smile big and I know that I have a wonderful team, family and coach to back me up!" - Lauren Nagy, Cedar Crest College, who won the third section of advanced walk-trot-canter. "No matter how cold the day may be or who your draw was, we are all here because of our love for horses and passion for riding. I try to remember that this is the reason why we are all here. IHSA is great because you get to be on a team surrounded by friends who all share similar interests and are always there to support you. Thanks LCET!" - Linnea Carver, Lafayette College, who won the fourth section of novice flat. "The success of Scranton's equestrian team comes from our members friendship and support along with constant support of our coach. We are not individuals riding but a team that competes together." - Colleen McCormick, University of Scranton, who won the fourth section of advanced walk-trot-canter. "I am a sophmore at Rutgers university and after taking two years off from riding to focus on lacrosse I came back to riding and haven't been happier. With the support of my family and friends, I have enjoyed my time riding in the IHSA and am looking forward to continue riding in it for the next two years." - Stephanie Dickson, Rutgers university, who won the second section of beginner walk-trot-canter. Show Incidentals: Partly sunny skies, with temperatures reaching the low '50's. Novice over fences and maiden crossrails classes held indoors. Start time: 8:58AM. Finish: 4:22PM - Includes 41 minute lunch break/Coaches and Captains meeting. Point cards posted in this region? Yes. Alumni classes held in this region? Yes. Judge: Karin Immerman. Stewards: Kalmar/Lehigh University, Fiorot/Moravian College and Speziale/East Stroudsburg University. Team Totals: Rutgers University (High Point Team) 35; Kutztown University (Reserve) 33; Lafayette College 31; Lehigh University 28; University of Scranton 26; Cedar Crest College 19; Bloomsburg University 17; East Stroudsburg University 17; Wilkes University 8 and Moravian College 7.